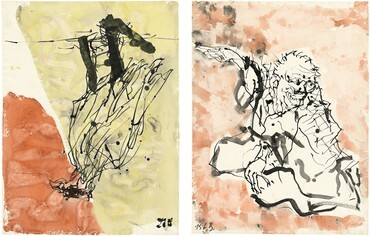 I don’t want to create a monster, I want to make something which is new, exceptional, something that only I do . 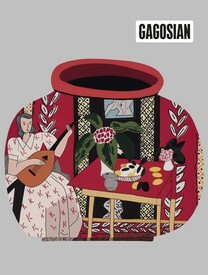 . . something that references tradition, but is still new. 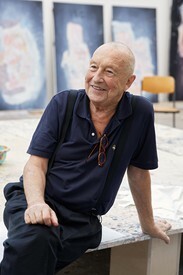 Gagosian is pleased to present an exhibition of new paintings and sculpture by Georg Baselitz. 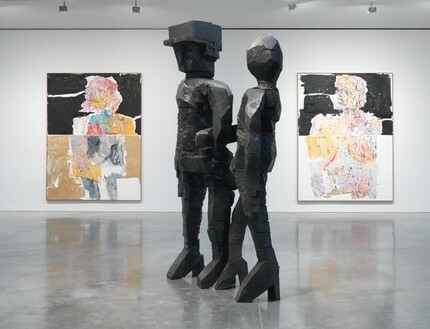 Baselitz’s challenging career is a constant process of counterpoint, marked by intense periods of creative activity culminating in a masterpiece or group of masterworks, followed by a startling renewal and rethinking of the subject. 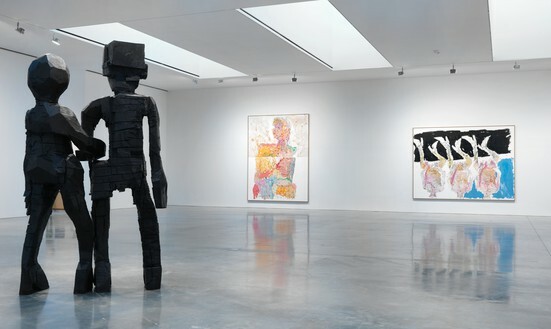 A traditional artisan, he produces paintings, drawings, prints, and wood sculptures, often on a monumental scale. 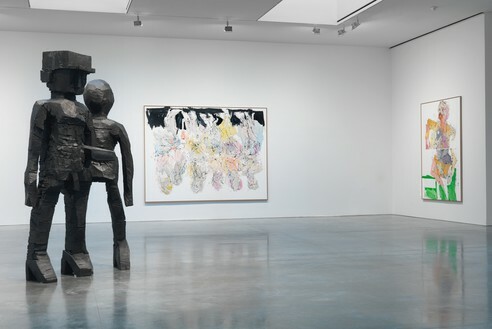 Baselitz has consistently explored what it is to be German and a German artist, although his oeuvre owes as much to a broader range of influences, including art brut, the drawings and writings of Antonin Artaud, sixteenth-century German woodcuts, and African sculptures. 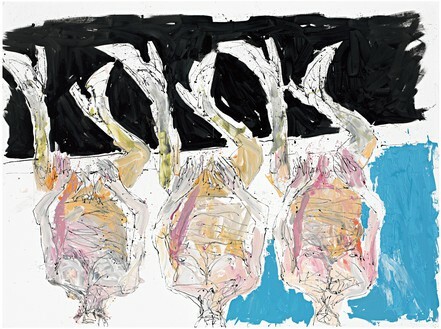 While his chosen forms embody an aspiration for the latitude and grandeur of postwar abstraction, the tormented and fragmented motifs that characterize his early works express the burden of postwar economic and spiritual depression. 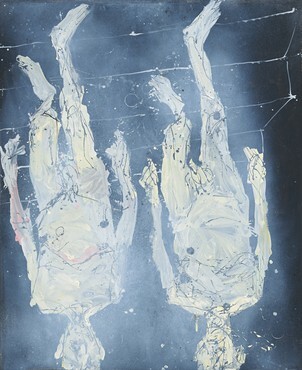 With the reunification of Germany in 1990, the angst seemingly ebbed from his vision and, for the past two decades, Baselitz has infused his work with lightness and a sense of spontaneity. 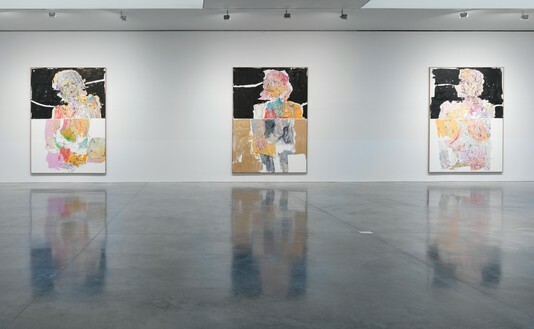 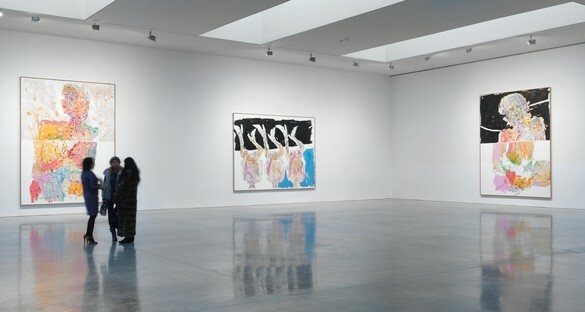 In his new paintings, larger than anything he has done previously, Baselitz has revisited provocative aspects of his own history, such as the fractured paintings of 1966, reinterpreting them with the experience of hindsight. 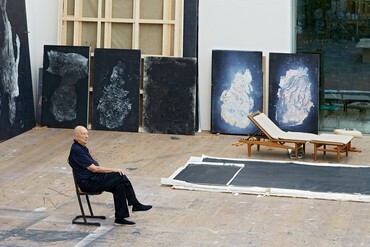 For the past decade, he has painted on the studio floor, crawling across the surface of the canvas as he works. 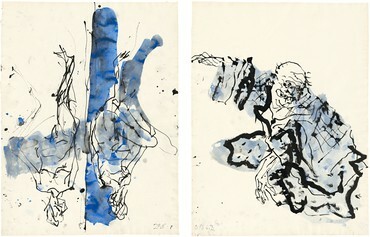 While creating a fluid yet drip-free surface, this method denies him a total view while working; rather he must rely on intuition. 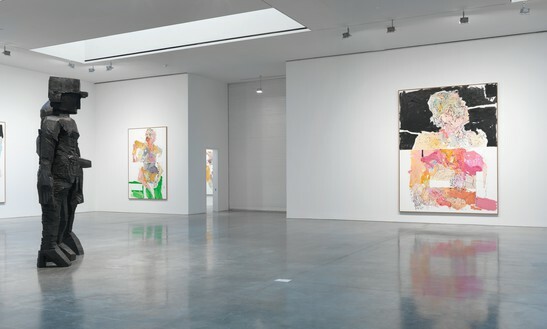 Vast and rapidly painted, with swathes of bright, gossamer hues and explosive, meandering lines, these paintings are radical transubstantiations, part-recollection, part-ghost, of their rather opaque, weightier predecessors. 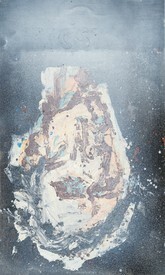 In Beginging (2011), and Ist Franz Pforr in Rom? 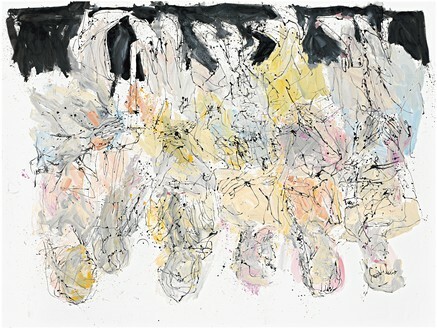 (2011), genderless, abject bodies surge with color and life, washed with swathes of translucent sky blue and orange, contrasting with black and white corollary that fills the other half of the canvas. 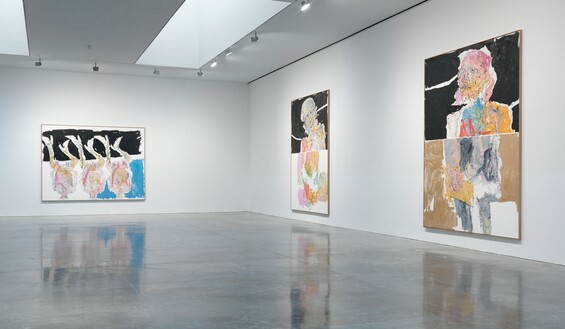 The impulse to improve, clarify, and update is clearly evident while, conversely, the haunting, fleeting quality of the work reveals a mature artist’s meditations on time, presence, failure, and possibility. 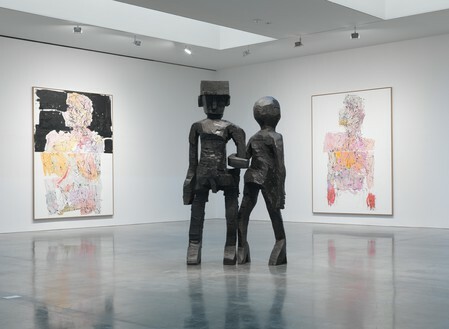 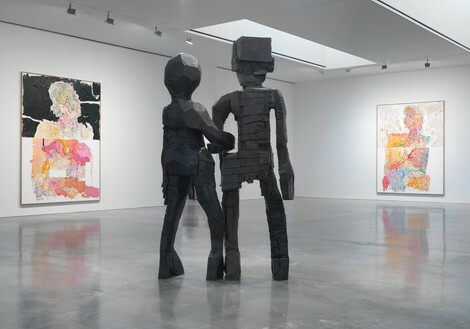 Baselitz is also known for his roughly hewn and boldly painted wooden figures, which fuse traditional woodcarving techniques with primitivist and folk art impulses. 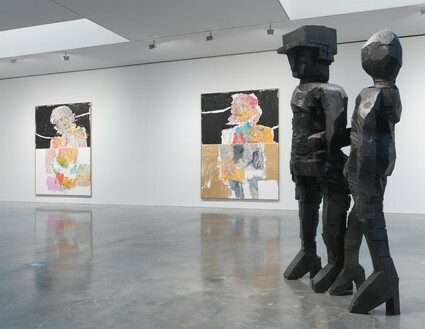 In conceptual and formal contrast to the expressionist directness of working in wood, he has also explored large-scale bronze-casting. 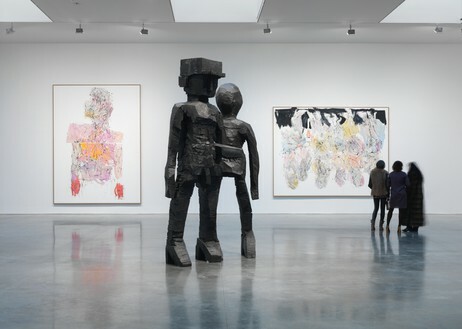 In Sing Song Zero, a double figure derived from a carved wooden form, the lyrical quality of the figures linked by the undulating curves of their arms is countered by the staccato hacks and scars of the original surface that have been rendered in a seamless cast surface.